At Gear Up Cyclery one of our primary goals is to make sure our customers get a great fitting bike. Before you purchase a bike, you should plan to spend a few minutes working with us to make sure that the bicycle you are interested in best suits your riding style and needs and that it’s also the right physical size. We will be happy to help you. Once you have purchased a bike it should be adjusted to fit your body while you sit in a stationary position, boosting comfort and efficiency while minimizing the potential for injury. This Static Fit service includes saddle height and fore-aft seat position adjustment and handlebar height. This service is provided free to all customers purchasing road bicycles from Gear Up Cyclery. If you have purchased a bike elsewhere or are bringing in your existing bicycle, the cost for this service is $65 and it takes approximately 15 to 30 minutes. Developed in partnership with Dr. Andy Pruitt of the Boulder Center for sports Medicine, Body Geometry FIT is a comprehensive fit system that creates the perfect marriage between bike and body. Through an opening interview, 20-step fit assessment, detailed equipment adjustments, and a thorough follow-up, our Body Geometry FIT technician can adjust all riders’ bikes to fit their bodies. The cost for this service is $195 and takes approximately three hours. BodyGeometry Fit has been adopted by thousands of bike shops around the world and serves as the premier bike fitting method for many of today's top professional cyclists. Shoes, saddles and gloves are just a few of the technologies developed by Specialized to ensure rider performance and comfort. Farther: Built-in varus angulation improves pedaling alignment for greater power and endurance. Also prevents knee pressure and strain. Faster: Built-in arch support and metatarsal button eliminate hot spots and numbness and helps maximize your power transfer with proper arch support. Comfort: Three distinct levels of arch and metatarsal support help you customize your fit. Developed with ergonomic expert Dr. Roger Minkow M.D., our Body Geometry saddles are scientifically tested and ergonomically designed to reduce pressure for all-day riding comfort. Comfort: The anatomically designed Body Geometry cut-out or groove takes pressure off arteries and soft tissue for improved blood flow and comfort. Pressure mapping research helps us determine areas of high/low pressure so we can optimize the design of each saddle. Fit: Since a properly sized saddle increases your comfort and power on the bike, Body Geometry saddles come in a range of widths to fit every rider. Efficiency: We design the shape of every saddle to complement the way you ride. Based on your position and preferences, you can find your match from a variety of flat, curved, and comfort saddles. Fit: Our palm construction, seam placement and premium materials optimize comfort and fit. Comfort: We tune the size and location of the padding for riding position and experience. 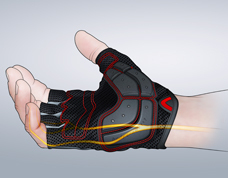 Protection: Our ergonomically shaped Body Geometry Gel padding dissipates pressure on the ulnar nerve to reduce numbness.